If you have one or multiple missing teeth, then dental implants can be a desirable alternative to dentures or bridgework. Dental implants are very strong, non-removable teeth that are indistinguishable from your own natural teeth. In the early days of dental implants, people who had lost a great deal of jawbone through the prolonged wearing of dentures, or through periodontal disease, were not seen as suitable candidates for implants. Advancement in the field of dental implants has now progressed to the point where jawbone loss and infection does not hinder the implant procedure. Options such as bone grafts are available, although it will mean that the dental implant procedure will take longer. Your dentist or periodontist will be able to advise on all of the available options for your specific condition. Basically there is no limit on the number of teeth that can be implanted. You can have only one tooth implanted, or a full upper and lower set implanted. If you are having a tooth extraction then you may opt to have an implant procedure at the same time. This can only be performed if there is no sign of disease, and the bone below the extracted tooth is strong enough, otherwise bone grafting may be required. If the extraction and implantation can be performed at the same time then you will be saving around three months of treatment. The procedure itself is performed over a number of visits. The first step will be the actual placement of the implants. The implant placement can usually be achieved in one visit and you will be sedated using anaesthetic for the treatment. The implants, made from a range of materials such as titanium, are set into the jawbone. The gums will then be left for three to six months for the biological bonding process to take place. During this time you will be fitted with a temporary denture or bridge, and may be advised to eat only soft foods for a few weeks after the operation. The second step of the procedure will be around three to six months after the first step. On this visit the gums will be cut open and metal posts will be inserted into the implants. If your temporary teeth need to be adjusted, the periodontist or dentist will also see to this during this visit. The final step of the treatment will begin around two to six weeks after the posts have been inserted. A number of visits will be needed to get the new, false teeth adjusted to perfection, in both size and colour. The new teeth need to match any remaining teeth that you have and should be completely natural. Some periodontists or dentists will ask for a photograph of you smiling prior to the operation, in order to get an idea of the size of your previous teeth. This step in the dental implant process should take around one to two months. In total, the whole implant process could take around eight months, but may take longer if bone grafts are needed, or if treatment of infection is required. Providing you adhere to proper at home dental care and regular dental visits, your dental implants should last a lifetime. Timescales can vary from individual to individual, but providing there is no form of serious infection, there is no reason why the implants cannot last for the rest of your life. Smokers may have some problems and they are usually advised to give up smoking during the actual implant treatment as smoking can hamper healing of the gums. Dental implants are seen as the ultimate alternative to removable dentures and are considered cosmetic dentistry. The cost of implants, even for a single tooth, can be quite high, but it may be less expensive in the long run. Prolonged wearing of dentures can sometimes cause bone damage, and expensive operations to resolve this problem may be needed at a later stage. It may save you time and money investing in dental implants sooner rather than later. Dental implants may not be for everyone; they are expensive and the procedure does take many months to complete. 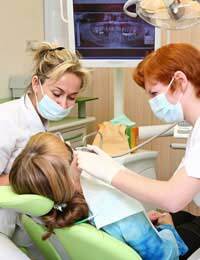 However, the results are very strong, permanent teeth that cannot be distinguished from your natural teeth. The benefits to your appearance and confidence should outweigh the time and expense that implants can incur.